Dyson is following up its acclaimed Supersonic hair dryer with its latest hairstyling gadget: the Airwrap Styler. Tapping into the current vogue for healthy hair styling, the Airwrap Styler is designed to create curls, waves, and bouncy blow drys without using extreme heat that can leave your stands feeling frizzy and dry. The Airwrap Styler uses jets of air to create curls and waves, which should lessen the effects of heat damage and tangling when styling your hair. Dyson has engineered the Styler to make use of the Coanda effect, which causes high speed air to follow the contours of a surface in a similar manner to a liquid - a phenomenon also used to high effect in motor racing. This effect in turn “attracts, wraps, and curls the hair around the barrel”, which should make styling your hair an absolute breeze...literally. 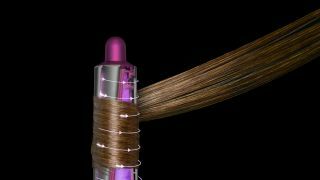 The Airwrap Styler comes in three different varieties with a number of different attachments, including a dryer, smoothing brushes, curling barrels, and more. Dyson is claiming its invested £75 million into researching the science of hair to date in a bid to confirm that it's more than just hand-dryers and vacuum cleaners that it can produce. It’s available to buy now in the UK from £399.99 online and in Dyson stores. The Dyson Airwrap Volume + Shape and Smooth + Control models both retail at £399.99, whereas the Dyson Airwrap Complete costs £499.99 - although you do get a few more attachments for your money. In Australia, the Airwrap Styler's complete package, with all attachments, will be available from October 13 at David Jones and Myer, but is already available to purchase on Dyson's own website for $699.